Many people are in LinkedIn jail but have NO idea that each day their sentence gets extended (sad but true). Knowing how to keep out of LinkedIn jail is so important. The algorithm beasts and engineering back end processes mean that content, actions and profile visibility is in incarceration mode because of how you have managed and your actions on the platform. In this article I will explain how to keep out of LinkedIn jail and steps to help you get out if have been nabbed. If you are in jail (or on parole) your posts will be ranked at the bottom of the barrel (if off the radar) you wont maximise the algorithm content process, will be unable to connect easily and overall your visibility penalised. And that means you wont get the results you want and/or need. There are 3 main jails cells that can impact your overall feed and engagement results on LinkedIn. No 2 & 3 are critical to LI results. There is a 4 step classification process which rates content and articles into Spam – Low – High quality (Image/Text/Video/Long Form/Link). DO focus on on good quality content. How to judge what is good (and its up and down with the editors) but essentially content that elicits engagement and value to the reader, opinions and sharing of ideas and values. Do NOT just comment ‘Nice post, Thanks’ on other peoples posts. This is classified as LOW engagement and is held in historical data – impacting your visibility. And EVEN WORSE, don’t use 3rd party auto robot tools and extensions to post auto responder inane comments on your behalf on posts and blogs. This also damages your brand and market respect long term – because it is evident that the comments made are non human (once you pick the pattern) and have no engagement or obvious relevance to the content itself – just the keywords being picked and flung into something quite trite. Do NOT use 3rd party content links masquerading as your content. Original Pulse articles (blogs) are important for LI integrity. So don’t use the outsourced systems that feed keyword search articles back and auto post them. This is almost considered SPAM in LI engineering world.. This continues the jail cycle to almost ‘never to be released’. How to check if this is happening ? Just look at the comments, likes and shares metrics (which are often between 0-4) on the such Articles. 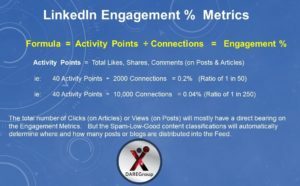 LinkedIn want engagement on Posts and hence Blogs/Pulse articles no longer get the reach and visibility. So any campaign that promises great results with daily Pulse articles (original or not content) wont work and downgrades the editorial reach. BUT there is workarounds here for the content Articles really are valuable BUT only when there is a link from the Posts section to Articles. 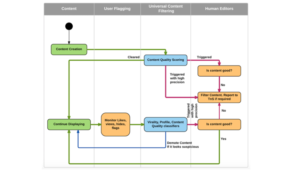 We just need to tweak how we put out content and mix it up. Check the % metrics of your content vs your connection numbers. This is critical and cull connections who are just there via 3rd party auto tools to buff up your numbers. They don’t add to yours, theirs or others content. For example if you have a post and have 12,000 connections you would assume high engagement. BUT not necessarily if the quality of your network isn’t in tune, aligned or relevant. LinkedIn know what is happening behind and downgrade your visibility and feed of posts. I have spent considerable time analysing metrics on 100’s of profiles. The results are frighteningly clear when a profile is in LI content jail. And yet people are none the wiser and are often spending $$$ for systems and tools which just extend their sentences. LinkedIn is a science and an art – and needs strategic and thoughtful content and network management. You must keep aware of updates and observe the user agreements and algorthim changes to keep out of LinkedIn jail. 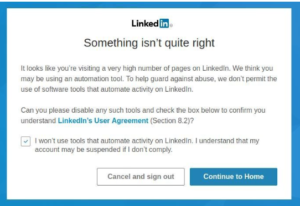 If you are unsure if you are or have been in LinkedIn jail for these issues or others, give us a call for a jail check!